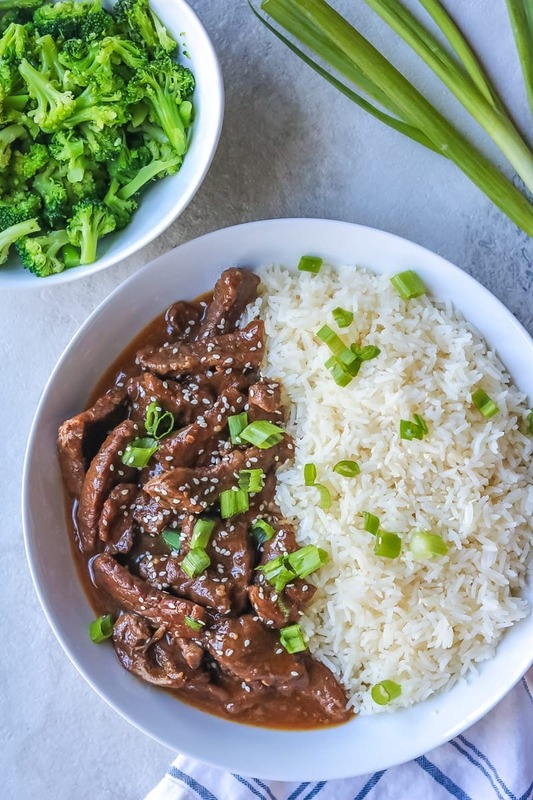 This Instant Pot Mongolian Beef is made healthier at home in less than 30 minutes with tender flank steak and a restaurant quality sweet and savory sauce. Plus directions to cook rice at the same time using pot in pot method! Do you guys like to order Chinese take-out? I have to tell you that I don’t think I have ever ordered Asian take-out since I have been married. It is not that I don’t love Potstickers, Eggrolls, or Orange Chicken–I do love them. BUT I can easily make my favorite Chinese recipes at home without MSG or being fried. So I can eat an extra serving and not wake up in the morning regretting that decision–you know what I mean? 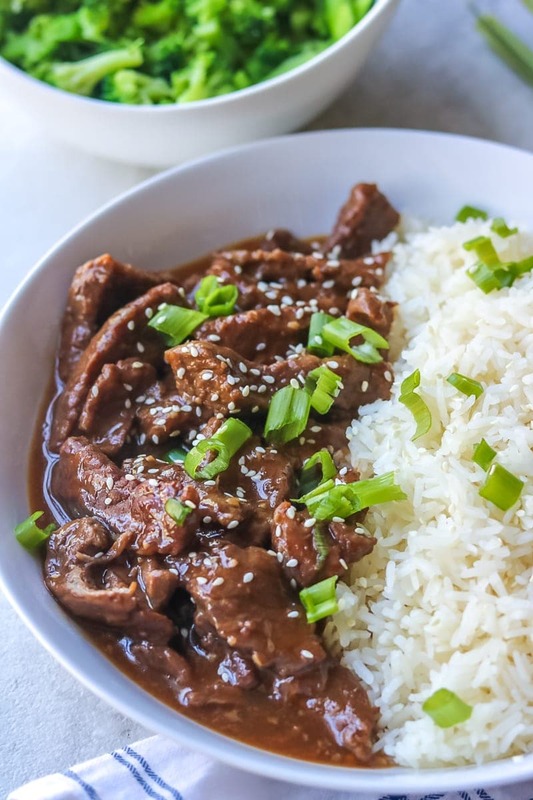 One of my husband’s favorite Asian recipes is for Mongolian Beef—full of flavor, a bit of spice, and a touch of sweetness. And with my pressure cooker, I can make him one of his favorite dishes in less than 30 minutes. Mongolian Beef for the Instant Pot is quite a simple dish to make. But the most important thing to remember when making Mongolian Beef is to choose the right beef and then to cut the beef against the grain. What is best kind of meat to use for Mongolian Beef? Flank Steak is the best choice for most stir-fried beef recipes because flank steak is lean and yet extremely flavorful. It’s intense beef flavor holds up well to strong sauces in Asian Beef dishes and when cut correctly, is extremely tender. If you can’t find flank steak at your store, skirt steak or hangar steak are great substitutes. Sirloin steak will work in a pinch too–just be sure to cut very thin. Part of the secret to restaurant quality tender beef that you get at your favorite Chinese take-out restaurant is all in how they slice the meat. It is very important to slice beef against the grain at home to achieve that tender quality, but what exactly does it mean to cut meat across the grain? To cut against the grain, means to cut in the opposite direction of the fibers in the meat. The fibers of the meat look like lines running through the meat and are easy to recognize on tough cuts of beef like flank steak. You don’t want to cut parallel to those fibers, instead you want to cut so that your knife blade forms a T.
In flank steak, the fibers of the meat run from top to bottom, so you are going to slice your cut of meat on the shorter side. TIP: I find it easier to cut the beef in thin strips if my meat has been frozen for 5-10 minutes prior to slicing. Slice the meat against the grain into very thin strips (about 1/4-1/2 inch thick). Turn your Instant Pot to saute. Once it reads “HOT,” add in 1/2 -1 tablespoon oil and let heat for 1 minute. Add in beef and saute until JUST browned, about 2 minutes. Most Mongolian Sauces are made with lots of soy sauce and sugar. I opted to make my Mongolian Beef lighter by using low sodium soy sauce, a bit of honey, and used pineapple juice for extra sweetness and flavor. Just like my Instant Pot Chicken Breasts, pineapple juice is the secret to this sauce. Mix together soy sauce, pineapple juice, garlic ginger, honey, and red pepper flakes together. Put lid on Instant Pot and turn vent knob to the sealed position. Hit manual and then adjust the cook time by using the plus or minus buttons to 3 minutes. After cook time has elapsed, let rest 5-10 minutes and then do a quick release. Turn Instant Pot back to saute. Make a cornstarch slurry by mixing cornstarch with 2 tablespoons water until fully combined. Add cornstarch slurry to pressure cooker and stir and boil for 2-3 minutes. Mongolian Beef is great served over steamed rice or with cauliflower rice. Top with toasted sesame seeds and green onions if desired. The flank steak cooks up on high pressure in only 3 minutes after sauteed and that is the same amount of time that Jasmine rice cooks in the instant pot on high pressure. For this reason, I like to make rice using the pot-in-pot method when cooking Mongolian Beef. Saute the beef as directed. Add in all the ingredients for the Mongolian Sauce. Insert a rack in the Instant Pot (right over the Mongolian Beef Mixture). 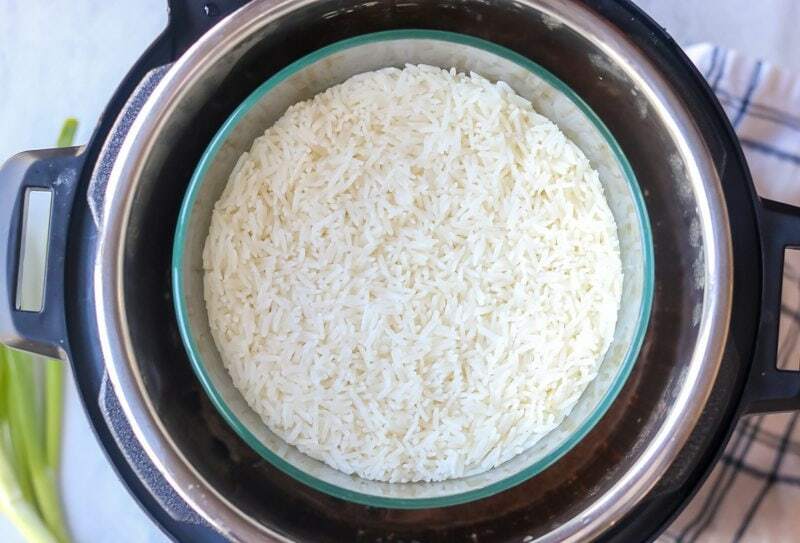 Place a 7 cup oven safe dish on top of the rack and put in 1 1/2 cups Jasmine rice and 1 1/2 cup water (or stock). Close the instant pot and turn valve to sealed. Cook on high pressure for 3 minutes. Let pressure release for 10 minutes and then open the Instant Pot. Remove the rice and rack from the inner pot and proceed with thickening the Mongolian Beef with the cornstarch slurry as the recipe directs. Can you Make Mongolian Beef with Frozen Beef? Yes, you can absolutely make Mongolian Beef with frozen beef. However, you need to remember three things. The beef needs to be sliced BEFORE freezing. A large cut of flank steak will not fit in the Instant Pot and the sweet sauce could burn before cook time would elapse. You can not sear frozen beef, so eliminate that step along with the oil from the recipe. Instead, you just add the ingredients for the sauce along with the frozen beef. Increase cook time from 6 minutes to 8 minutes. I often purchase large amounts of flank steak when on sale, and cut into thin strips before freezing and then grab for a quick dinner recipe. If you do not want to use honey, brown sugar can be substituted. You can also increase honey or brown sugar if you sweeter dishes. I would not increase to more than 1/2 cup. Use Tamari for a Gluten-Free Mongolian Beef. Pineapple juice is a great way to add sweetness to the dish naturally to cut back on the amount of added sugar. If your flank steak is frozen in strips, increase cook time to 10 minutes. Adjust amount of red pepper flakes based upon how much spice you like. Okay now that you know ALL the tips, onto the recipe! Check out all my Healthy Instant Pot Recipes HERE! Your favorite Chinese take-out is made healthier at home in less than 30 minutes with tender flank steak and a restaurant quality sweet and savory sauce. Prepare you flank steak by slicing against the grain into very thin strips (about 1/4-1/2 inch thick). If you want to sear your meat, turn your Instant Pot to saute. Once it reads "HOT," add in 1/2 -1 tablespoon oil and let heat for 1 minute. Add in beef and saute until JUST browned. About 2 minutes. Mix together the soy sauce, pineapple juice, honey and seasonings and add to Instant Pot. Hit manual (you will have to first turn the Instant Pot OFF from Saute function) and then adjust the cook time by using the plus or minus buttons to 3 minutes. Turn Instant Pot back to saute. Make a cornstarch slurry by mixing cornstarch with 2 tablespoons water until fully combined. Add cornstarch slurry to pressure cooker and stir and boil for 2-3 minutes. Turn off instant pot and serve Mongolian Beef with rice, cauliflower rice and top with scallions or sesame seeds if desired. It is NOT necessary to sear your meat first. Instead, put flank steak with soy sauce, honey, pineapple juice, garlic, ginger and red pepper flakes in Instant Pot and cook on high for 8 minutes. Follow instructions for adding cornstarch slurry as written. If you do not want to use honey, brown sugar can be substituted. this is legit one of the BEST meals I’ve ever made. My family loves it. Including my children who basically live on nuggets. YAY!! I am so glad you enjoyed this meal! It is one of our favorites as well. Definitely a new family favorite! Thank you! I love you cam make and rice, and yummy beef at the same time! How time saving! It really is a time saving, delicious recipe Brandi! Hope it helps you out on busy nights. Hi there, this recipe looks amazing and I plan to make it tonight. Just wondering, am I supposed to cook on high pressure for 3 or 6 minutes? I see both listed in different places. Whoops! Great catch. For thin flank steak, 3 minutes is the cook time. I fixed in post now. Thank you! I’m very eager to try this recipe tonight! Thank you for posting this great sounding recipe. I have a new Instant Pot I am eager to use, and I already bought the Pyrex 7-cup container so I can do pot-in-pot recipes. My Instant Pot only came with a wire rack that is about 1 inch tall however – that doesn’t seem like it would be tall enough allow the container to sit above the beef. If you have purchased another rack, can you please give me some specifics? Thank you! Hi Bee! I know it does not seem like the rack will be high enough, but it works. Don’t worry if the water touches the bottom of the pan 🙂 Enjoy!!! How can this be done without an Instant Pot? Hi Andy! To make without a pressure cooker–simply heat your oil in a skillet over medium high heat. Sear your sliced flank steak for 2 minutes. Whisk together ingredients for sauce (with cornstarch) and add to skillet. Toss with beef and cook until sauce is thickened–about 3-5 minutes. Flank steak cooks super quickly, so this is a fast skillet meal. Enjoy!